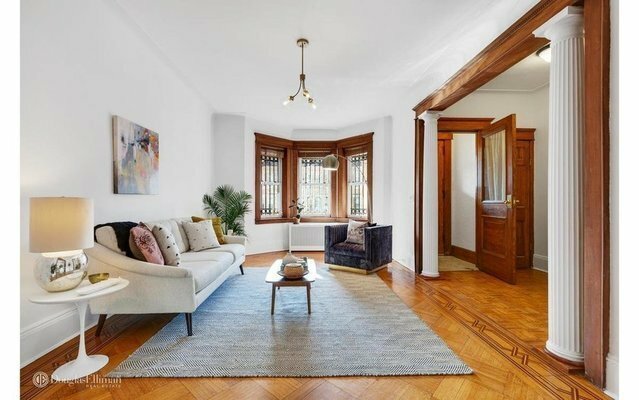 Charming four bedroom townhouse with beautiful period details and eastern and western exposures. The first floor has a spacious living room with fabulous afternoon sun, original parquet floors and beautiful wood archways to the front hall and dining room. The spacious dining room gets morning and late afternoon sun, has parquet floors and a large pass-through to the kitchen. Cooks will love this upgraded kitchen with new stainless appliances and incredible counter space for meal preparation. A door from the kitchen leads to the backyard patio and plush garden with flowering trees and many beautiful flower beds. The garden features a mature crab apple tree, two raised organic garden beds and several flowers that bloom throughout the warm months. The top floor has a large, light-filled master bedroom and three more good-sized bedrooms with closets. The hallway and renovated bathroom have skylights. The basement has a half-bath, W/D and storage, as well as backyard access. Have a seat on the front porch and enjoy the view of the front garden. A short distance to the Q/B train at Newkirk Plaza and to the F train at 18th Ave; 35-minutes to midtown.